Hydrangeas are a popular species of flowering shrub that produces large clusters of fragrant blooms in the summer. Approximately 23 species of hydrangea exist, but only five species are widely cultivated in the United States The Hydrangea macrophylla, also known as French, big leaf, florist, or garden hydrangea, is a Japanese native and the most commonly grown species in America producing large white, pink or blue flowers. Other cultivars include the mophead, lacecap, panicle, smooth, and oakleaf—the latter two hydrangea species being natives of the southeastern United States There are generally three reasons why hydrangeas will not fully bloom. Oakleaf and bigleaf, or mountain, hydrangeas produce flowering buds on the previous year’s growth. Pruning these two species of hydrangea in the fall, winter, or spring of the following year could potentially destroy any of the coming summer’s blooms. The best time to prune the oakleaf and bigleaf hydrangea species is right after blooming in summer to avoid removing any flower buds that would appear and bloom the following year. Panicle and smooth, or wild, hydrangeas are two species that bloom based on the current year’s growth. Trimming them back in early summer could mean that the blooms will fail to appear that year. Prune these hydrangeas, if necessary, only in late fall. While most hydrangea species benefit from some protection from the hot summer sun, too much shade, particularly for some species, can greatly reduce flowering. The smooth hydrangea grows best in partial to full shade, but the oafleaf and panicle hydrangeas prefer full sun. If nearby trees have reduced the amount of daily sunlight that existing hydrangeas receive each day, trim the tree branches back or consider transplanting them to sunnier location. Some species of hydrangea have blooms that are particularly vulnerable to bad weather. Oakleaf and bigleaf hydrangeas produce blooms from plant growth of the previous year, so early fall freezes that occur before the shrubs become dormant for the winter can be damaging. Late spring freezes can also destroy the fragile buds that are just beginning to appear on these shrubs. To provide protection from freezing temperatures, cover hydrangeas with a large sheet or blanket the night before a freeze. Coverings made from natural fibers, such as cotton, are best. As soon as temperatures rebound above freezing the following day, completely remove the covering from the shrubs. Grow hydrangeas in fertile, well-drained soil for optimum growth and flower production.Water the shrubs regularly, especially during times of drought. 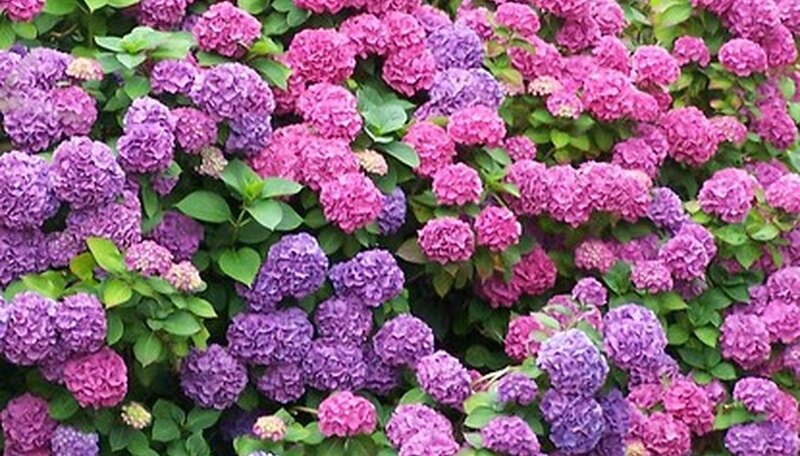 Bloom colors in some hydrangea cultivars can be changed from pink to blue by adding acid or alkaline fertilizers to the soil. Hydrangea Questions and Answers. The United States National Arboretum, Updated Sept. 28, 2005 (Accessed Oct. 27, 2009). Evans, Erv and Richard E. Bir. Smooth and Oakleaf Hydrangeas. NC State University Horticulture Information Leaflets, Revised July 1998 (Accessed Oct. 27, 2009). How Long Does a Hydrangea Shrub Live?